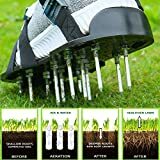 BUILD HEALTHIER LAWNS:26 nails pierce the lawn,simple lawn aerating and nutrients supply to make your lawn more healthier. TIGHTLY TIED THE SHOES: 4 metal buckle,4 adjustable straps.It can be tightly tied to your shoes, the metal buckle extremely durable will not be destroyed. POKE INTO THE SOIL: There are 26 2.2-inch nails, fast and easy lawn aeration, absorb nutrients and air. DURABLE MATERIAL: Lawn shoes for all sizes of shoes. The base is made of hard, environmentally friendly plastic, more durable, perfect fit your shoes. AFTER-SALES SERVICE: We are committed to creating the best customer service of the lawn aerator shoes.We offer a lifetime warranty and after-sales, waiting for your contact. â˜€1.To make your lawn more greener. It will be better when using on moist lawn. â˜€2. Experience the fun of lawn aerating and it is a great workout for your calves and thighs. You only need to walk repeatedly on your lawn and they are suitable for all sizes of shoes. â˜€3.Get durable lawn aerator shoes at a bargain price. They are cheater than an aerator machine and have durable materials that can long-term holding. â˜€4.Only 5 minutes installation, easy to install. Four bundles of straps. One bundle with two straps, 4 x 2, 8 straps. â˜€5. Sturdy material and perfect after-sales service. The base is made of polypropylene and HDPE. Lifetime warranty service, if you have any questions, please feel free to contact us.